It was still early, I had picked up a quick breakfast at 7-Eleven. Fried chicken and a bottle of green tea. The chicken at convenience stores in Japan can be addictive, although not too healthy I presume. But that’s another story. I was walking through an urban area, along a major road. Heavy traffic. Highrise on each side of the road, smaller houses crammed in between the taller buildings, wherever you could fit them. An urban concrete jungle. Pretty much like every city in Japan. As I came around a corner, I found myself, all of a sudden, in front of a quiet park. 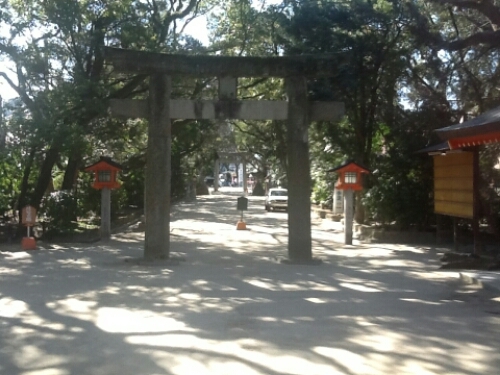 A torii gate marked the entrance, a path leading through a grove of trees behind. In the distance you could see the bright orange of a Shinto shrine. 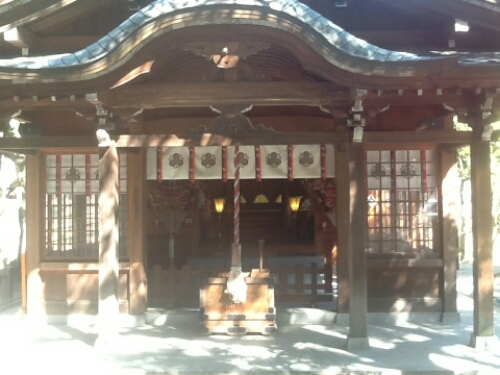 This also like any other city in Japan, you can always find a shrine hidden away between all the buildings. I finished my chicken, took a big sip of my green tea, at least my drink is healthy, walked into the park. 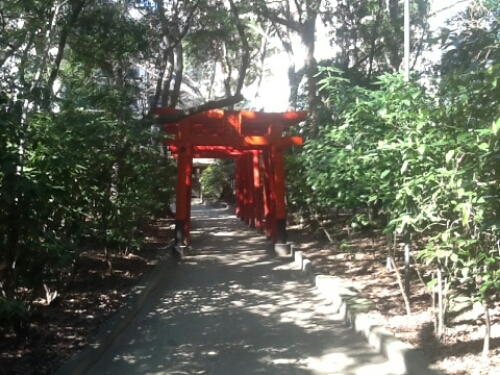 Passed under the torii gate, followed the path through the trees. Soon the path split in two, then split in two again and again. Smaller paths diverged off the main path, leading to smaller shrines, or just the possibility of seeing the park from another angle. Down one path I spotted a torii gate path. I walked at random down different paths, stopping to admire the different shrines, different views of the park, eventually I made it to the main temple complex. Sumiyoshi Shrine in Hakata belongs to a series of Sumiyoshi Shrines in Japan, laid out in along the Inland Sea from Osaka to Hakata. Sailors on their way from Osaka, the commercial capital of Japan, to Hakata and further on to China, would stop at the different Sumiyoshi Shrines along the way, praying for a safe sea voyage. The kami (gods) enshrined at Sumiyoshi Shrines have been protectors of sailors since ancient times. 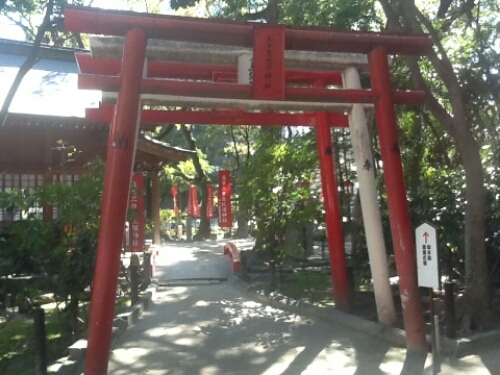 Sumiyoshi Shrine in Hakata was the last of the Sumitoshi Shrines to be visited, after Hakata came the Japan Sea, then China. Today the Sumiyoshi Shrine in Hakata contains a wealth of historical documents and artifacts, many classified as cultural properties. Sumoyoshi Shrine is a large shrine, nothing like the massive temples in Kyoto, or Meiji Shrine and Park in Tokyo, but larger than most shrines in Japan. Not just a small shrine tucked in between two buildings. It lies in the middle of a big park containing several smaller shrines as well, the whole temple area occupies a city block. The shrine itself lies within a large open area, the whole area lined with stalls selling different charms and spells as usual. Japanese religion never misses a chance to make some money, although prices for charms aren’t expensive, they make great, cheap souvenirs. I buy one for safe travel, I always need one of those. I take a walk around the complex, look at the different statues, different shrines. A few people are coming to pray, stopping in front of the shrine, clapping and bowing. I find myself in front of a massive statue of a sumo wrestler, his hands reaching out, his face fierce. He looks ready to fight. 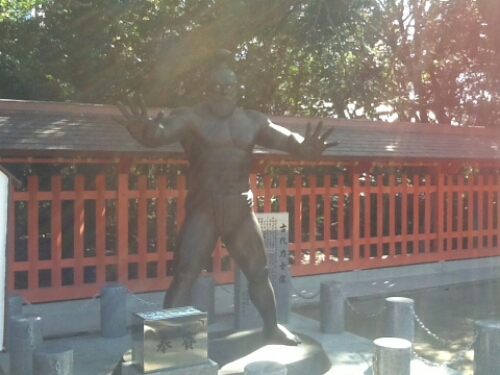 A plaque beside the statue tells how the Sumiyoshi kami is also the gods of the Sumo wrestlers. And culture, art and poetry. Kami can clearly be helpful in several different areas. I leave Sumiyoshi Shrine with a good feeling, lucky to have found the place. I had no plan of visiting, did not even know of it, was simply walking around, taking random turns as I slowly got closer to my destination. Sumiyoshi Shrine is a beautiful shrine, a very quiet getaway from Hakata/Fukuoka, a quiet city by Japanese standards anyway. Finding a shrine dedicated to sumo was cool, and the garden was nice even though it was still early spring. A month later, in full bloom, it would be magnificent I reckon. 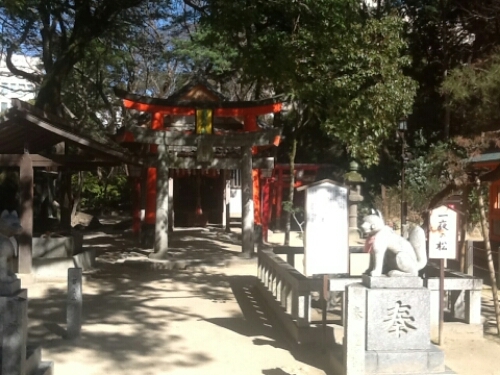 Sumiyoshi Shrine is easy to find in Fukuoka. When leaving Hakata Station from the West Exit, simply take a left and follow Sumiyoshi Dori. 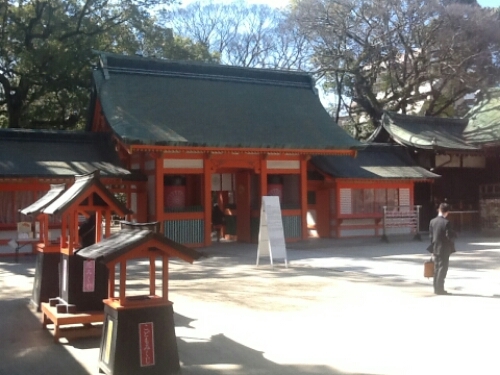 Sumiyoshi Shrine can be found on the right after about ten to fifteen minutes. This entry was posted in Japan and tagged fukuoka, shinto, sightseeing, sumo on July 14, 2016 by Traveltorgeir.